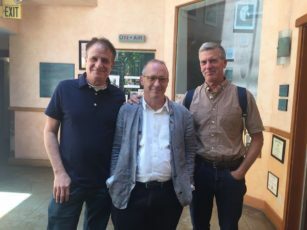 left to right: Richard Wolinsky, David Sedaris and David’s boyfriend Hugh. David Sedaris, whose latest collection of essays is titled “Calypso,” in conversation with host Richard Wolinsky. David Sedaris has a national following based first on his contributions to the NPR radio show “This American Life,” and later with essays collected in such books as “Barrel Fever,” “Me Talk Pretty One Day” and “Let’s Explore Diabetes with Owls.” His latest collection, “Calypso,” follows on the heels of the publication of his diaries from 1977 to 2002, and while often comedic, also deals with darker issues such as the death of his sister Tiffany, and politics in America today. In this wide ranging discussion recorded in late June, 2018, he talks about gay parades, his father’s obsession with Trump, his own obsession with garbage collection and fitbit steps, and how he creates and molds his essays.